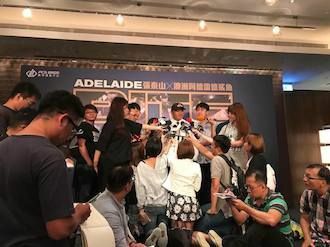 The Adelaide Bite, proudly presented by SA Power Networks, hit a home run with the Taiwanese Media on Wednesday as they held a press conference in Taipei to officially announce the signing of slugger Taishan Chang. Taishan, affectionately known as Tarzan to his beloved followers, is one of the greatest Taiwanese baseball players of all time. 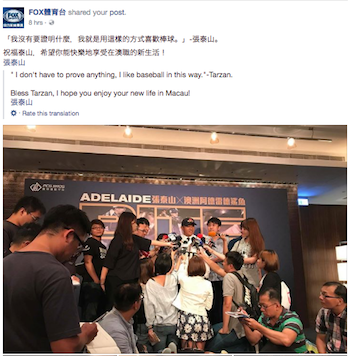 He has nearly two decades of international team experience and is widely considered the best Chinese Professional Baseball League (CPBL) player ever. He has 292 career home runs (or 'booms' as they call it) and over 1400 RBIs, both CPBL records. He comes to Australia for the love of the game and a quest for 300 bombs. 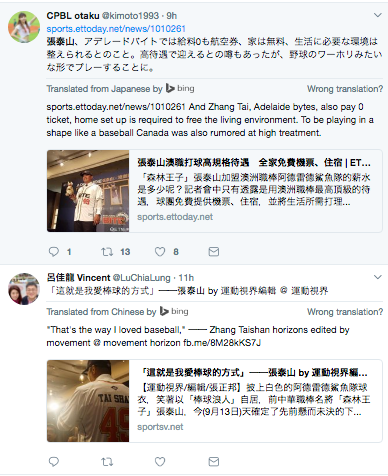 Bite GM Nathan Davison and Baseball South Australia President Mark Snelgrove were both in Taiwan for the press conference where they were greeted with "Tarzan Fever" and a media frenzy. 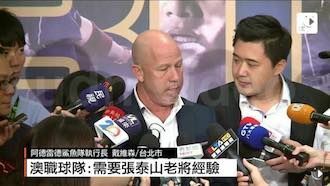 About 80 people, mainly made up of the press and potential sponsors, attended the press conference at the prestigious W Hotel. Around the media circles in Taiwan, it was picked up by every form of media - in the newspapers, online, on TV and on Radio. Check out some links, screenshots and photos below! As you can see, Davo got some airtime on multiple Taiwanese TV stations! Twitter had it's say too! Yes, it certainly was a busy day! You can watch the full conference by clicking here. What fun we will have this year with the Adelaide Shark Team! Get your tickets and memberships at www.adelaidebite.com.au/tickets.